Racks or shelves decoration is not so much related to the interior design, but to decorating art. That is, actually, what we may do in our own free time. It is not right to consider racks as just a functional furniture items. 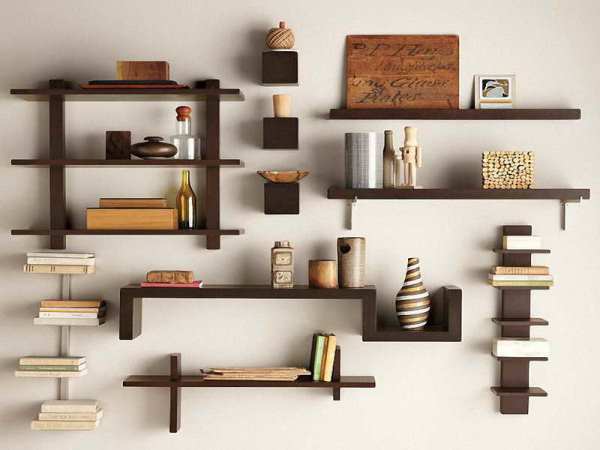 With certain principles and tricks you can turn ordinary shelves into a stylish decor item that will reflect your interests and match the style of your home. Here your imagination is limited just by available objects. You definitely should not use only the books. Put all that makes sense to you on the shelf: collections, souvenirs brought back from travels, frames with photos, trophies and awards, beautiful dishes and vases of flowers. If you are afraid to make a mistake with a combination of colors, then use no more than three colors. When decorating the rack, you can add another neutral color (white, black, gray). 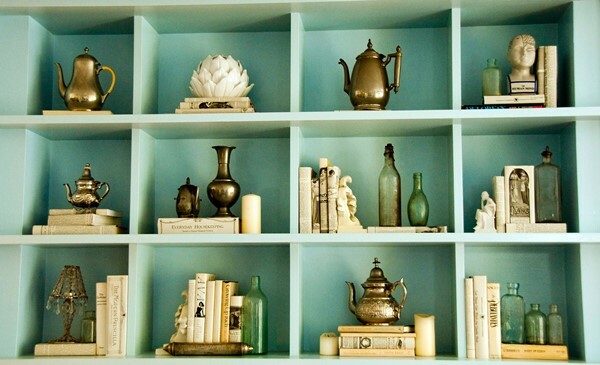 Combine color of decor on the shelves with other interior items colors. Beautiful boxes, wicker baskets look neat and aesthetically pleasing. Use them to hide different small items, magazines, books, dishes, and other things, not intended to be placed on display. Take a look on the rack decorated by a professional decorator. Everything looks logical and harmonious. How to achieve the same effect? If you visually connect lines between vintage jugs, white books, figurines, aged greenish bottles, you will see triangles. Each item in this composition has a clear position corresponding to the triangle rule. Moreover, the triangles are not necessarily identical and isosceles. Different shapes of triangles add dynamics to the composition. Such composition looks balanced and logical. All items on the shelf must be in harmony by height: if you want to put a low vase or small statues on the shelf, put them on a pile of books. Thus you will install them on a pedestal and draw attention to them. If you put a low item on the shelf, put a book or a photo frame behind them to balance the height of the composition. Do not fill every inch of shelf books and decor. Even interesting items may stray into a shapeless heap, if you are not visually separate the objects from each other. Another win-win situation: use several identical objects standing in a row or symmetrically on adjacent shelves. Here we have in mind not only the physical, but also the visual weight. Arrange volume encyclopedias and magazines pile on the lower shelves. Deliver small books in beautiful covers, decorative items, candles at eye level. The lower shelves carry functional tasks, the upper ones – aesthetic.